After a video went viral on Twitter showing a college-age Alexandria Ocasio-Cortez dancing on a Boston University rooftop, the new House representative defended herself from her would-be ridiculers by breaking out a new set of moves. In the original video, Ocasio-Cortez is seen dancing exuberantly alongside other students and wearing a Boston University T-shirt with her hair flowing in the wind. The 2010 clip was part of a larger music video showing BU students dancing on the College of Arts and Sciences building to the song "Lisztomania" by the band Phoenix, according to the school's BU Today website. The clip surfaced when an anonymous Twitter account shared it to try to insult the New York Democrat, calling her a nitwit. The video went viral Thursday, the day Ocasio-Cortez was sworn into office. 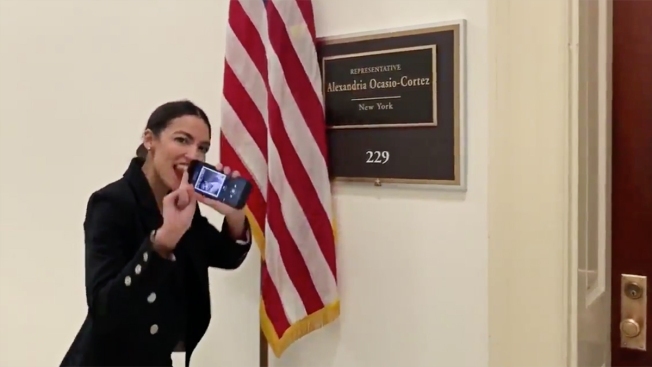 Some attempted to mock the politician with the video, the original poster later deleted the account, and others rallied to Ocasio-Cortez's defense. Comedian Ike Barinholtz wrote that Ocasio-Cortez was "being fun and cool," and actor George Takei said he wants her to "give me dance lessons." Ocasio-Cortez fired back Friday with a smile and twirl, tweeting a video of herself cutting the rug in front of her new Capitol Hill office. This time, she sported a dark pantsuit, red lipstick and pulled-back hair. "I hear the GOP thinks women dancing are scandalous. Wait till they find out Congresswomen dance too! Have a great weekend everyone :)" she wrote on the post. Fellow Congresswoman Ilhan Omar (D-Minn.) supported Ocasio-Cortez's groove, tweeting, "If we can't dance it's not our revolution." The 2010 clip even received its own tribute Twitter account: @aoc_dances. The user posts the video with various songs playing in the background, including One Direction's "Best Song Ever" and Toto's "Africa."